You may remember that back in 2009 I read a wonderful debut work (I say work because it was a mix of short stories and a novella and yet some thought was a novel) by the author David Vann. When you read something quite as powerful, moving and shocking as ‘Legend of a Suicide’ then, if you are like me, you can’t wait for the next novel by the author. Yet when ‘Caribou Island’ arrived as an advance proof copy I was worried, would I like his new book as much as the first or could it have suffered the dreaded ‘difficult second novel’ curse? I was relieved when I finished ‘Caribou Island’ because it was a brilliant read, though I can’t quite say I enjoyed it as with its subject matter to say you enjoyed such a novel might make you sound a bit mad. We meet spouses Irene and Gary both in their mid-fifties and who seem separately rather unhappy and having slight mid-life crises. Irene’s way of coping seems to be the onset of a mysterious disease, doctors say there is nothing wrong and yet she is sure there is and often finds herself unable to get out of bed for the pain. Gary’s answer to his situation is action, though you sometimes wonder if it’s his way of trying to push his wife away, and to build a dream log cabin on the remote island near their home in Alaska. This is no easy task and with the atmospheric and tempestuous backdrop and Vann’s power with a sense of menace behind every page you know you are on a journey that might make for rather uncomfortable reading (not in a gory sense), though you have to read a long anyway. I was worried with its opening paragraph of a hanging that ‘Caribou Island’ would be very like its predecessor and in some ways it actually is. There is the Alaskan backdrop, the ominous sense throughout, the stunning writing and the feeling at any moment the author could take you to another darker place. I did wonder if Vann had felt safest having the similarities around him moving from collection to novel or if he just hadn’t finished with the subject and its setting yet? 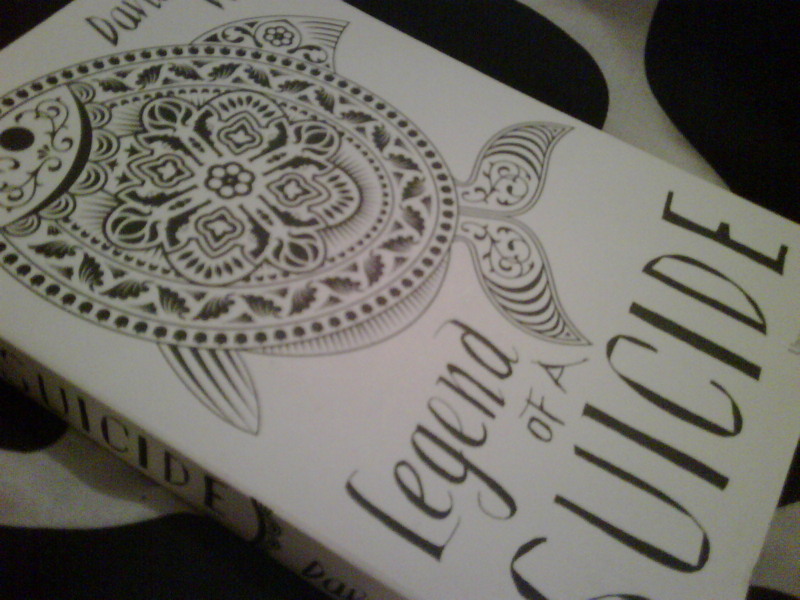 Unlike ‘Legends of a Suicide’ when awful things happened (which of course I won’t give away, I wasn’t left shocked. I sort of figured what was coming early on whereas in one scene in ‘Legends’ I actually had to put the book down a while and get my head round it. Yet ‘Caribou Island’ does beat ‘Legends’ on several points. Rather than a father son relationship, which is seriously lacking in this novel as Gary’s son Mark is rather distant from his family as a whole and would rather do ‘extreme fishing’ or get stoned than spend any time with them, we look instead at the relationships with couples. As well as Gary and Irene we have their daughter Rhoda and her dentist fiancé Jim who isn’t the initial nice guy we might want him to be, and you do want him two as Rhoda seems so nice. I did notice that in all the couples, bar Carl and Monique where with her femme fatale elements and his utter doormat behaviour buck the trend, that men seem to be depicted as utter swine’s whilst women come across more rounded, accommodating and rather dependable. I mean would you cook your fiancé dinner after he’s not spoken to you for two days or maybe help your husband shift logs across a lake in a storm for an isolated cabin you have no desire to live in? I did wonder if Vann had felt safest having the similarities around him moving from collection to novel or if he just hadn’t finished with the subject and its setting yet? ‘Caribou Island’ has left me with two thoughts first I am hoping his next novel (which I will rush out to read) blows me away by how completely different it is and two that I don’t think I ever want to live near a lake in Alaska, who knows what could befall me? The first bookish bits of 2010 is a bit jam packed, I apologise though it will be worth it. There is a lot of help and recommendations needed today but as a thanks there is a chance of a winning some goodies (ooooh). One thing that there won’t be is any moaning reports on how difficult it is to not buy books as I am saving that for Monday I will be reporting back on that soon enough. So first up was a bit of a request from one of your favourite non blogging people Granny Savidge Reads, or just Gran, who whilst on the phone the other day asked me if I could post something on the blog. She would love to hear some bookish thoughts from you all about ‘The Blue Flower’ by Penelope Fitzgerald. Now the message was a bit garbled as she was in the middle of stripping the kitchen but I gather that this was a choice at one of the many book groups that she is a member of which got cancelled. So she is now feeling slightly annoyed she can’t discuss it and as I hadn’t read it I couldn’t discuss it with her. If you have reviewed it on your blog leave a link as well as your thoughts and I think Gran will pop by. If they are rave reviews who knows it might go on my wish list. It seems Gran has been rather snowed in, hence the book group cancellation and so no Blue Flower chat, as I showed you in a picture I am now going to show you again as it links to my next enquiry. Though I had heard of some, and of course read The Snowman (though I am not after Christmassy tales) as a child, most I know little or nothing about and so wondered which snow filled books would you recommend to me, would any of the above be on the list? Mine would be ‘Child 44’ by Tom Rob Smith which has some murders in the snow or my most recent snow filled read, and one that I adored, ‘Legend of a Suicide’ by David Vann. Both I have realised are quite dark snow filled books. Funnily enough this book ties in with a giveaway, the first two of three opportunities to win a copy this marvellous book from the very kind people of Penguin open to you internationally. If you pop a link or your thoughts on ‘The Blue Flower’ by Penelope Fitzgerald then you will be entered into one draw. Leave recommendations for snow filled reading then you will be entered into another draw for a copy. Do both and you double your chances, you have until the end of Tuesday… Good luck! P.S I know you would have all joined in without prizes but I do love a good giveaway! It seems strange to me that two of the best books I have read in 2009 have been within the last few weeks of it. I am also going to possibly sound like a stuck record when I tell you that my second book review this week is down to Kimbofo once again as she gave me a copy of David Vann’s ‘Legend of a Suicide’ at one of our Book Group meetings after I banged on about how much I wanted to read it on her blog. Though book gifts are always welcome there is then that awkwardness of making sure you read it asap (or in this case within three months of getting it) and then after that what happens if you don’t enjoy it? I wouldn’t know the latter this time luckily as Legend of a Suicide is marvellous, if again another difficult book to capture in words. What is it with these reviews this week, is the end of 2009 testing me? Legend of a Suicide is less a novel and more a collection of five short stories and one novella sandwiched between them. All the stories here deal with the same subject of a father’s suicide, the effects it has on him and those around him leading up to the event and in the aftermath of it. This is a subject close to the author David Vann’s heart as his father killed himself when he was younger. Though not a work based on his own life the emotions and thoughts are very much in every page of the novel making it quite an affecting book as well as an unsettling one. Even though each tale is quite different they are all based around Roy and his father or the effects his father has on him and others in varying ways. The first take Ichthyology looks at life through a younger Roy’s eyes as he watches his parents break up and has to deal with it by becoming interested in fish (fish is a theme throughout the book though I am not sure why). However its also an insight to his father and the life he has ended up with that this tale really brings home before the deed in the title is done. Rhoda, the second story, is about Roy’s father’s second wife and the relationship they all have giving you further insight into his life and mind. This tale actually made me laugh quite a lot and seemed darkly comical. The third instalment is also witty; A Legend of Good Men is all about all the men who his mother dates who come and go ‘like the circuses that passed through our town’. Then comes the novella, we what I think is a novella, in the shape of Sukkwan Island. This tale is so well written and delivers such a punch half way through, I wont say anymore than I had to read the paragraph three times before I could believe what I had just read, that sadly the follow up tales Ketchikan (a tale of his fathers past as Roy revisits) and The Higher Blue (an idealisation of everything) fell a little flatter than they might have. However having said that you need all these isolated tales blanketing the middle novella for it all to work. Sukkwan Island is just amazing writing, differing from the first person narrative of the rest of the book and written in third person, I don’t think I could put it any other way. It evolves around a year long excursion into the wild for father and son in the Alaskan wilderness. I can see why people have compared him to Cormac McCarthy though I would put this tell as a cross between McCarthy’s The Road and Stephen King’s ‘The Shining’ its remarkable, shocking and breathtaking all at once. I was horrified by it yet fascinated and mesmerised by it all at once. I read it in one sitting and couldn’t put it down. It’s a remarkable book in so many ways, I think Vann has put all his emotions into it which therefore cannot help but pour out of the page and into the reader which is quite an experience and one that you don’t get too often. Will it make it into my Best of 2009 tomorrow? You will have to wait and see. The only reason that it might not is that I haven’t had long enough away from it to let it all settle (even the unsettling bits) with me yet, but you may very well see it in there. Who else has read this, who really wants to? I can fully recommend it.